The recent huge scandals regarding Banking, the BBC, Energy Price Fixing, News Corporation – all have one common thread, the lack of critical cultural diversity among the leadership and senior management. Psychologists have long shown that group think is dangerous, and is perpetuated when we have people from the same culture and similar backgrounds who feel very comfortable with one another, and build a cocoon which can take the organisation onto a precipice. The world is multi-cultural, but leadership is often mono-cultural, and this is a very serious disjuncture whose price we are all paying. He said: “In my opinion it is still overmanaged and the managers speak gobbledegook. "Any editor or head of department spends their lives filling in forms and answering questions that are not necessary, using language that is so arcane like platforms and genres. “Even George Entwistle was called head of vision – which nobody in the outside world understands – [why not] head of television? It has gone bonkers. This is an example of the rot of mono-culturalism. Challenge gets diminished when teams are from the same cultural background and set of experiences. Have you wondered why despite the huge Banking crisis in this country, there has not since been a single conference on ethics in banking organised by the fraternity? They simply do not want to question their values and ethics, and allow diversity into the dialogue. They dont even want to talk about ethics, so will they ever act on them? With the new NHS reforms, authority is now going to go to Clinical Commissioning Groups headed by General Practitioners – will this be another recipe for disaster and group think, when people speak the same language with the same educational backgrounds and definitions of health? Where will the diversity of thinking and leadership come from? Did you know that of all the Footsie 100 global companies in Britain, only 1 in 16 Directors are from ethnic minorities/foreign nationalities? This in spite of the fact that the companies trade globally and generate over 80% of their profits abroad. There is a lot of research which shows that mindset and narrow thinking are fundamental problems in the Boardroom. 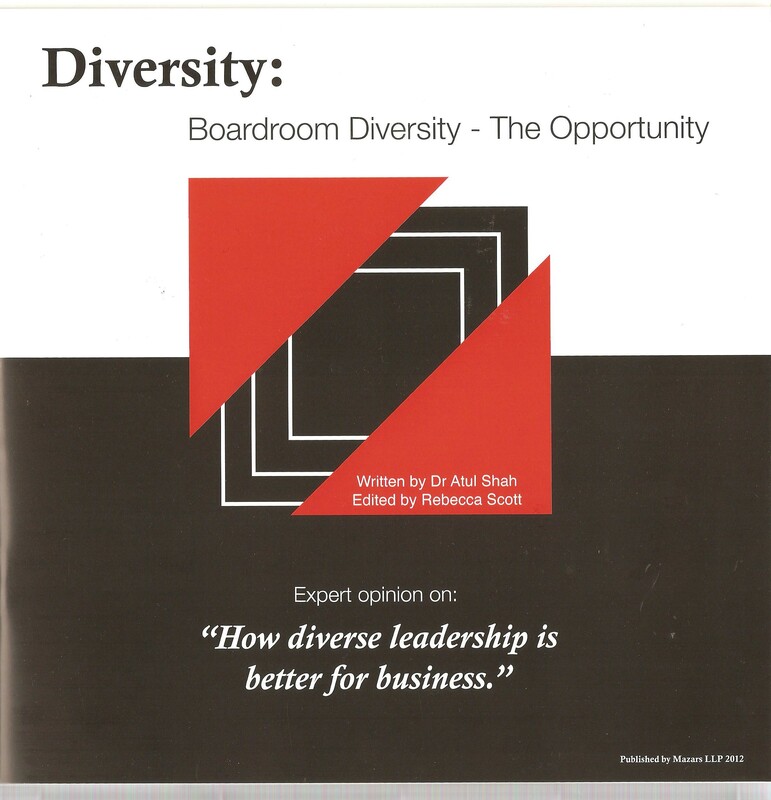 Our book on Boardroom Diversity – The Opportunity covers this and has senior leaders making a very strong case for genuine Boardroom challenge and diversity. Only 1 in 16 of current FTSE 100 board members is from a Black, Asian and Minority Ethnic (BAME) background. 1 in 8 employees in the UK are from Black, Asian and Minority Ethnic groups. Only 0.8% of local councillors in England are Black, Asian and Minority Ethnic. Only 6.9% of public appointments are held by Black, Asian and Minority Ethnic individuals. Diversity UK aims to build a network of diverse leaders who can begin to influence transformational thinking and action. It comes from a deep social concern for the future of Britain – to improve this economy and society, leadership desperately needs to be inclusive and not exclusive. A similar group, the 30% Club, which has been promoting the cause of women in the Boardroom, has had huge publicity in the media, and this is also hot political news with the Davies Report and recent European pressure for transforming the Boardroom. However, there is very little mention in these reports about the importance of cultural diversity – leaders from different backgrounds coming together to form a robust, inclusive culture and mitigate against risk and uncertainty. Could it be that by having more women in the Boardroom, we can tick the box of diversity, but at the same time reduce challenge, by keeping the women at bay through machoism, and reducing cultural challenge through mono-culturalism? So the status quo can prevail, and the scandals are bound to continue. My long time personal concern with this agenda, and the urgency of social transformation, has led to the creation of Diverse Ethics, and the research and consultancy work we have done to make a change. I first wrote a book called ‘Celebrating Diversity – How to live, enjoy and benefit from Great Coloured Britain’. To educate the nation about the huge creativity and strength that lies hidden in the country, I had gone on a Masala Tour of Britain in 2010, travelling 1500 miles and filming and reporting transformational stories. I have also started a Linked In Boardroom Diversity Network to create a forum to discuss these views and transform society. On the Masala Tour, I must have had over 30 radio and broadcast live interviews, following my journey. In the clients and organisations I meet, I see very simple and powerful creative ideas, which have simply not occurred to them, but ideas which if implemented, would lead to significant success and transformation. I can see them because I am culturally different, and able to articulate my ideas clearly. You will find a fountain of creative ideas on this website. Also I have significant breadth and depth of experience, having lived and worked in three continents and speaking four languages. However, I am also often surprised by the ignorance among leaders, and their slowness to adapt and change. Leaders are too obsessed with staying in their comfort zones and keeping power and holding on to it. And we are all paying the price of this intransigence. The huge paradox is that there is tremendous diverse talent in this country, but it is frustrated and strangled from entering the mainstream. Look at any professional body and examine the list of prizewinners, and you will find diverse names every year. University First Class rotas are filled with students from different cultural backgrounds who have the rigour and discipline and intelligence to excel in the system. But then when it comes to progression, institutions seem to be extremely frustrating. This is true in Politics, in Media, in Business, in Government and Quangos, even in the Charity sector. Not only do we have physical ghettoes among leadership, but we also have intellectual ghettoes where there is very little understanding of some of the most beautiful and profound wisdoms of the world. So do join Diversity UK and help bring about a positive revolution and transformation in leadership culture, thinking and behaviour so that we can all benefit as a society.